"Because they are a great source of potassium. Because yellow is our favorite color. Because hey girl, you made us go bananas. Because they have no fat, no sodium, and no cholesterol—and we take our future seriously. Because we need only our doctors' approval, not yours. Because we wanted to sing 2Pac's All Eyez on Me for karaoke and had to dress accordingly. Because society told us to wear scary costumes but we were born with Oppositional Defiant Disorder. Because they're the 4th largest agricultural product in the world. Because after you eat all of the Chex mix, you monster, we'll be the last remaining party favor. Because Americans eat more of these than any other fruit—and we love our country. Because they're technically radioactive and that seems like the start of a superhero movie. Because no other fruit costume contains tryptophan, which produces seratonin, which alleviates mental depression—and we are fans of happiness. Because monkeys are cool. Because we felt inspired by Gabriel Garcia Marquez's One Hundred Years of Solitude. Because why not celebrate the best fruit around? Because everyone is looking at us and not you—how does that feel? Because we are raising awareness for human rights violations in Banana Republics worldwide. Because we really, really enjoy that episode of Family Guy—and it's peanut butter jelly time!!! Because we are one with nature, aren't you?" 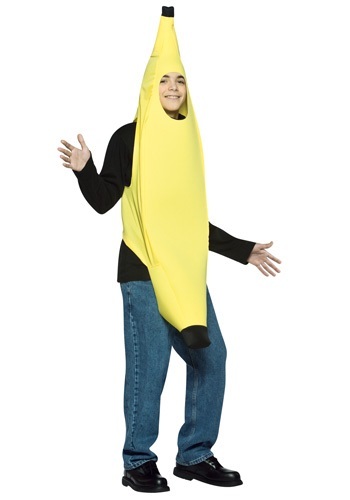 - What we'll say to anyone who dares ask why we chose to wear this awesome Teen Banana Costume.